Home / Unlabelled / Okada Ban: I Now Sleep, Wake at My Own Pace - Bishop Ezeokafor . Okada Ban: I Now Sleep, Wake at My Own Pace - Bishop Ezeokafor . The Catholic bishop of Awka Diocese, His Lordship Most Rev. Paulinus Ezeokafor, has commended Governor Willie Obiano's led administration for the courage in banning commercial motorcycle operators otherwise known as Okada in Onitsha and Awka, even as he said he has serious reservations about the timing of the notice. Bishop Ezeokafor who stated this at St. Peter's Catholic Church, Nkwelle, Awka during the burial of Noble Lady Juliana Chinwe Okika the mother of Rev. Fr. 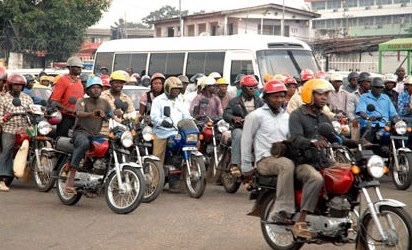 Emmanuel Kenechukwu Okika, said the ban had actually lessened the noise pollution ocassioned by the frequent movements of Okada riders, emphasizing that it had also restored sanity to the once noisy cities of Onitsha and Awka. 'I can now sleep and wake up anytime I like without any form of disturbance. The operators move around anytime without recourse to people's health or quiet time. I was away when the ban notice was issued. I came in to behold a serene environment,' he said. 'You know it is not easy to change a business, I learnt that some of them do not even know how to drive buses or shuttles. Government should please consider time when next they embark on directive like this. Now that the decision has been reached let the affected persons find another legitimate means to sort themselves out. I'm glad that the government through Anambra State Small Business Agency (ASBA) has provided an alternative means to cushion the effect on the affected persons. Let the Okada riders leverage on this initiative. I quite appreciate the government for taking such a bold step. 'I can now sleep and wake up anytime I like without any form of disturbance. The operators move around anytime without recourse to people's health or quiet time. I was away when the ban notice was issued. I came in to behold a serene environment. Government of Anambra State has done noble. I remember while growing up whenever we go for a holiday then in Onitsha we used to board buses or taxi and not Okada. Okada business is never a progressive business. 'The worst part of it, is that you'll see these Okada riders endangering their lives on the highways. You can not see such in a developed countries of the world. What you see is shuttles and taxi. I want the government to get taxi that will drop people at their destinations. On the issue of demolition of shanties, the bishop said the action had opened up once congested areas, noting that it would also improve the health condition of Ndi Anambra. 'You can not find such anywhere in the world even Calabar Cross River State. You can only see a very big gap between the road the surrounding buildings. You can not see people blocking the road with wares or even building on drainages. I think government deserves commendation. On grazing reserve, Bishop Ezeokafor described the decision of the South-East Governors' Forum as a noble one, saying that he had in the past frowned at the Federal government's decision to use collective Nigeria's patrimony to fund what he described as a private business. 'Yes, cattle rearing is a private business. Other ethnic groups who are into one form of business or the other are there without any consideration. Igbo traders are paying for shops and stores. FG should drop any plan of using our money to fund Fulani herdsmen. We are not fools. It is totally unacceptable. I align myself with the decision of the South-East Governors' Forum. We are not giving an inch of our land to anybody. We do not even have any land to give out. Where's the land if I may ask? Is it the one that is being ravage by erosion or another one? Instead of finding a lasting solution to the issue of erosion menace in the South-East Geopolitical Zone, they are there talking about grazing reserve. I have always advocated for ranching. Ranching is the best and modern way of rearing cattles anywhere in the world. Why is our own different? Bishop Ezeokafor queried.